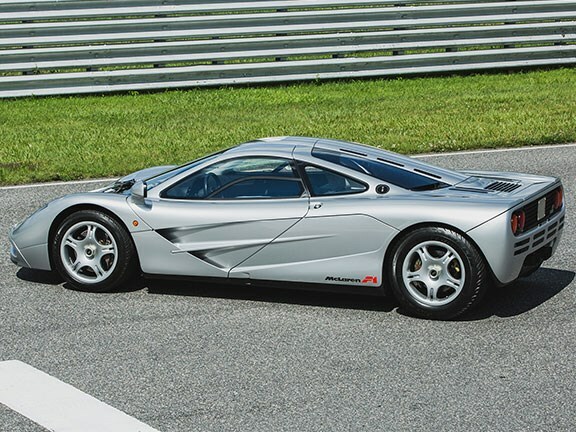 The McLaren F1, which was auctioned by Bonhams Auctions is chassis #044, built in 1995 and was the very first of only a handful of F1s that made it to the US, and was being offered for sale by its original owner. It came with documentation and service history from new. Boasting a staggering array of no compromise engineering, and an obsessively tailored vision for extreme performance and outright speed, the McLaren F1, designed by Gordon Murray, made no apologies for its audacious road presence and take-no-prisoners performance. It was the world’s first carbon-fibre reinforced monocoque production car and featured gold insulating foil scattered through the engine bay for heat containment. Twin Kevlar fans helped create downforce and this no expense spared super car, of which only 64 were ever made, set a world record top speed of 243mph (391kph). with no accident damage makes it one the rarest of all. Little surprise that it sold for a staggering $15.62 million US dollars, or roughly $20 million in local currency, making it the most expensive F1 ever sold.